View cart “Morningstar TS MPPT-60-600V DB Charge Controller” has been added to your cart. 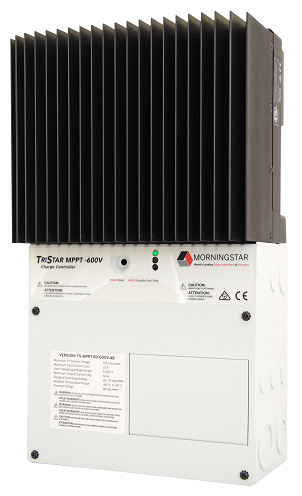 Morningstar’s TriStar MPPT 600V-48 uses Morningstar’s TrakStar MPPT technology coupled with the widest PV input operating voltage range available in a PV controller. TrakStar MPPT technology enables this charge controller to harvest the maximum energy from the solar array or wind turbine. The high-speed sweeping algorithm minimizes power loss and provides full visibility of the entire power curve from open circuit to battery voltage; ensuring the maximum power point is chosen under all ambient conditions. The TS-MPPT-600V-48 charge controllers are rated for 60 Amps of current output and are usable with PV modules or wind and hydro-electric turbines to charge 48 VDC battery systems. Their wide input operating voltage range of 5-525 VDC (full power range of 200-425 VDC), 600 VDC maximum open circuit voltage limit, and buck-boost design, allows a wide voltage range for string sizing. This also allows the controller to keep operating even if shade causes some modules in the array to stop producing power, or allows the controller to provide power in low-wind conditions if using it with a wind turbine. The TS-MPPT-600V controller also allows for remote communications, data logging, adjustability, and metering using open communication protocols and true Ethernet-enabled functionality. Communication ports/interfaces include Ethernet, EIA-485, RS-232 and MeterBus. Built-in lightning protection protects the circuitry from nearby lightning-induced voltage/current spikes. The large heat sink provides convection cooling without using any fans, so there are no moving parts. The components are epoxy encapsulated and the printed circuit boards are conformal coated for protection against moisture and dust. Advanced four-stage charging algorithm to optimize battery health. Self-diagnostics and electronic error protections make installation easier and minimize the chances of installation errors and system faults. The TriStar MPPT 600 V charge controller is available with or without a pre-wired DC Disconnect Box. The pre-wired DC Disconnect Box version, the TS-MPPT-60-600V-48-DB, can be used with positivelygrounded or negatively-grounded PV systems and helps to save on installation time and cost. The DC Disconnect Box includes the following features: PV disconnect switch, battery disconnect breaker (positive pole battery breaker), four busbars (one for each: PV +/-, Battery +/-), two standard 35 mm DIN rails, and internal barriers between the high voltage PV and low voltage battery wiring. A battery temperature sensor (RTS) is included. Wire terminals accept #14-#2 size wire. Both units are NEMA1 rated for indoor installation (IP20). ETL Listed to UL1741 and Canadian CSA C22.2 No. 107.1.01. FCC Class B Part 15 compliant. Ambient operating temperature range: -40 ºF to +113 ºF (-40 ºC to +45 ºC). The optional TriStar Meter-2-600V can be mounted on the front of the controller, and its 2 x 16 character LCD display shows extensive system and controller information, logged data, bar graph metering as well as alarms and faults for easy troubleshooting. The information may be shown in English, French, German, Portuguese or Spanish languages.